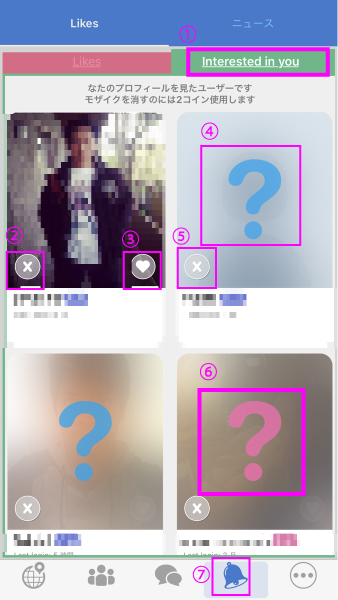 If you are not interested in the displayed users, tap X. If you are interested in the displayed user, tap ❤. I like each other so it is a match. You can check it with a friend from the friend list. ④ When you turn off the mosaic, details will come out. The user who saw your profile will be displayed. Let’s click on the picture and check the profile information. Already, if the other party pushes the heart, the match is established. Information is transmitted to the other party. Let’s prepare attractive profile information in advance. If you are not interested in the user without erasing the mosaic, tap X.